Editor's Perspective ® Insights and Perspectives for the CIO The Leading Role New technologies demand new duties for CIOs. Which will you fill? What is the proper role for a CIO? Should you be the traditional keeper of all things IT? A broker of pay-as-you-go IT services offered by cloud-based suppliers? Or something in between? Fact is, the role of the CIO is changing once again. 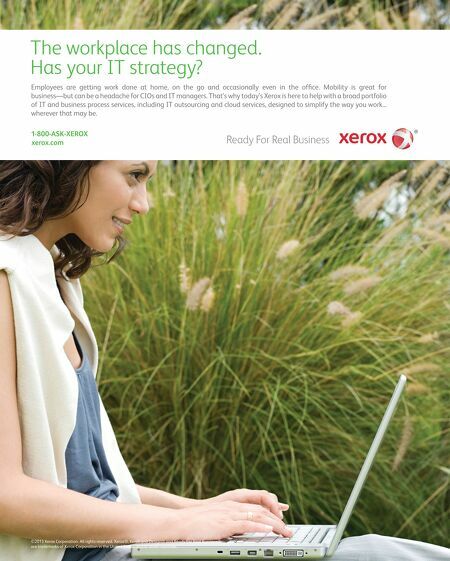 It's not that CIOs were looking for a new challenge. This is one that found them, in the form of new technologies that require IT leaders to work in new ways. So what is the CIO's proper role now? That's the question posed — and explored — in several articles in this issue of Smart Enterprise magazine. Our lead feature, "The CIOs New Look," takes a bigpicture view of the issue by focusing on a range of responses, everything from Netﬂix, where nearly all IT is on the public cloud, to General Motors, where CIO Randy Mott is implementing insourcing. Our Smart Industry section looks at the public sector, where IT leaders face all the challenges of their private sector colleagues — but also the perils of big government, including slow approval processes and tight budgets. Our proﬁle of Brigadier General Kevin Nally, CIO of the U.S. Marine Corps, shows an IT leader who is creating what he calls an ofﬁce of the future to create new and innovative IT solutions. And another proﬁle, this one of the National Film and Sound Archive of Australia, shows how Miriam Waterhouse, a businessminded CIO, is helping protect her country's cultural heritage. You'll also ﬁnd four columns. George Fischer of CA Technologies reprises his call for CIOs to become chief information orchestrators. Jacqueline de Rojas, also of CA Technologies, explains how developments in the U.K. point the way for IT leaders worldwide. Executive headhunter Shawn Banerji argues in favor of CIOs making the business case. And Peter Hinssen, noted IT author and speaker, discusses how IT must change in a networked age. How about you? Is your role as an IT leader changing? And if so, how? I welcome your comments and questions, either by email or on our online community, Smart Enterprise Exchange. Peter Krass Editor in Chief editor@smartenterprisemag.com PUBLISHER Mark Hoffman EXECUTIVE PUBLISHER Penni Geller ASSOCIATE PUBLISHER, EDITORIAL DIRECTOR Loni Frazita ASSOCIATE PUBLISHER Lucille Deane EDITOR IN CHIEF Peter Krass EXECUTIVE EDITOR Stephanie Stahl COPY CHIEF Claire Meirowitz PROGRAM DIRECTOR Ellen Lalier VP/DESIGN DIRECTOR Gene Fedele CREATIVE DIRECTOR David Nicastro ART DIRECTOR Giulia Fini PRODUCTION Adeline Cannone CONTRIBUTING WRITERS Karen J. Bannan, Leon Erlanger, Tom Farre, Tam Harbert, Larry Lange, Karyl Scott, Bob Violino To subscribe to Smart Enterprise® magazine, please visit join-see.com/magazine To contact Smart Enterprise, email us at: contactus@smartenterprisemag.com For information about advertising in Smart Enterprise, email us at: advertising@smartenterprisemag.com Copyright © 2013 CA All rights reserved. All trademarks are the property of their respective companies. Reproduction of material appearing in Smart Enterprise is forbidden without permission. 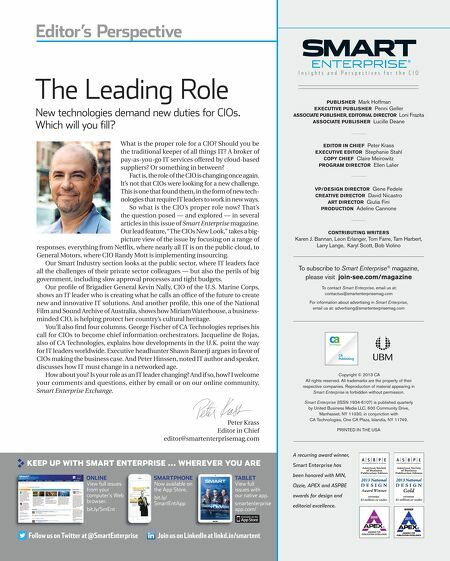 Smart Enterprise (ISSN 1934-6107) is published quarterly by United Business Media LLC, 600 Community Drive, Manhasset, NY 11030, in conjunction with CA Technologies, One CA Plaza, Islandia, NY 11749. PRINTED IN THE USA A recurring award winner, KEEP UP WITH SMART ENTERPRISE … WHEREVER YOU ARE ONLINE View full issues from your computer's Web browser. bit.ly/SmEnt Follow us on Twitter at @SmartEnterprise SMARTPHONE Now available on the App Store. bit.ly/ SmartEntApp TABLET View full issues with our native app. smartenterprise app.com/ Join us on LinkedIn at linkd.in/smartent Smart Enterprise has been honored with MIN, Ozzie, APEX and ASPBE awards for design and editorial excellence.